Fig. 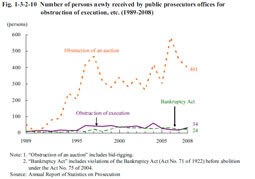 1-3-2-10 shows the number of persons newly received by public prosecutors offices over the last 20 years for obstruction of execution, obstruction of an auction (including bid-rigging; hereinafter the same in this subsection), and violations of the Bankruptcy Act (Act No. 75 of 2004; Act No. 71 of 1922 before abolition under Act No. 75 of 2004 for the period up to December 2004). The number of persons received for obstruction of an auction increased sharply between 1994 and 1997 and subsequently remained at a high level. Table 1-3-2-11 shows the number of persons prosecuted or not prosecuted for obstruction of execution, obstruction of an auction, and Bankruptcy Act violations over the last five years. Examining the details of prosecution in 2008 revealed that 100 persons were indicted and 181 were put on summary trial procedures for obstruction of an auction (of which 69 were indicted and 137 were put on summary trial procedures for bid-rigging), while those prosecuted for obstruction of execution and Bankruptcy Act violations were all indicted (Source: Annual Report of Statistics on Prosecution). See Appendix 1-6 for sentencing for bankruptcy-related offenses in the court of first instance between 2006 and 2008.